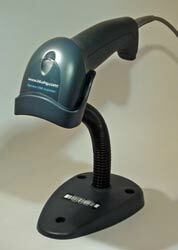 You can extend your database-programming to a complete POS-System with the Service USB series. 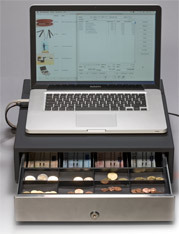 The cash drawer consists of a standard bottom box with cash drawer. It was modified by us so that it can be connected to the Apple Macintosh.o external power supply or printer is necessary to trigger the cash drawer. Simply connect it to USB and use it of OS9 or OSX. FileMaker, 4th Dimension and a lot of other programs are supported. 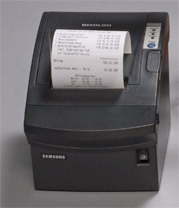 This is a quiet thermal receipt printer, which is able to print a receipt in less than one second without annoying dialogues or the loop via printcenter. The converter can be used to send serial characters of Runtime Revolution, 4th Dimension, FileMaker, RealBasic, AppleScript, Ragtime, Xcode C/C++, Cocoa, Java, CodeWarrior Carbon, MaxMSP, LabView and DirectorMX. It is included in scople of delivery of the receipt printer and barcode printer. You can buy it separately if you have already a printer or other serial stuff. It is able to scan multiple barcode types and works like a keyboard. A prefix and postfix sequence can give Instructions to your programm. 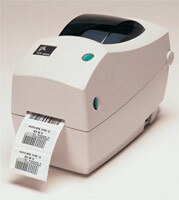 This label printer can be used to print adhesive labels. One barcode and two lines of Text (2x20 characters) can be placed on a 19mm x 51mm (0,75inch x 2inch) adhesive label.